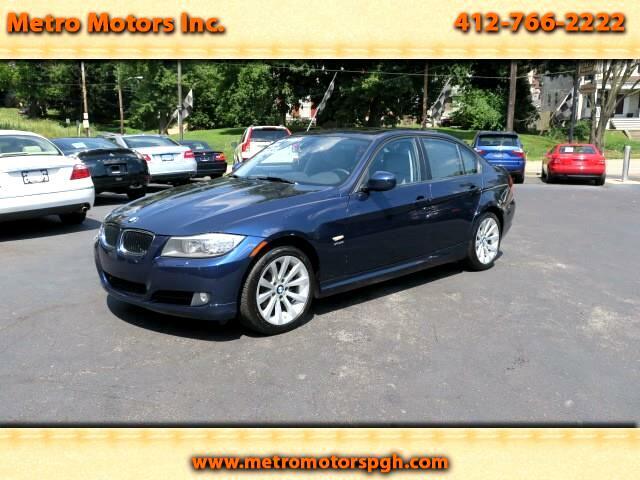 Used 2011 BMW 3-Series 328i xDrive for Sale in Pittsburgh PA 15202 Metro Motors Inc. Here is the one you have been looking for!! Pristine 1-Owner Garage kept 2011 BMW 328 X Drive ALL WHEEL DRIVE Sport Sedan. This one has ALL THE OPTIONS!! Finished in Deep Sea Blue Pearl, With Oyster Premium Dakota Leather Option with Burl Walnut Trim. Optional I-Drive System with Premium Sound, Satellite, USB, Voice Command Navigation, Traffic Monitor, Bluetooth. Parktronic Front & Rear Parking Assist. Smart Key. Adaptive Automatic Head Lamps. Electric Rear Window Sun Shade, and Rear Side Wind Sun Shades! Dual Zone Climate Controls. Tilt & Telescopic Leather Steering Wheel with Command Buttons. Automatic Headlamps. Rain Sensor Wipers. Power Glass Moon Roof. Tinted Glass. 18 Inch Sport Alloy Wheels. All Original Books Manuals. just serviced, Inspected, Smog Tested. Clean Auto Check History Report Showing 1-Owner, No Accidents, or Issues! !